The BBC's Jazz Book of the Year for 2008. Few jazz musicians have had the lasting influence or attracted as much scholarly study as John Coltrane. Yet, despite dozens of books, hundreds of articles, and his own recorded legacy, the "facts" about Coltrane's life and work have never been definitely established. Well-known Coltrane biographer and jazz educator Lewis Porter has assembled an international team of scholars to write The John Coltrane Reference, an indispensable guide to the life and music of John Coltrane. 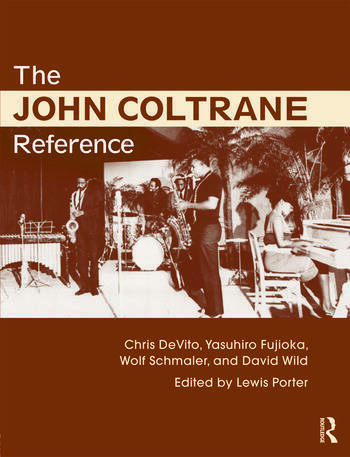 The John Coltrane Reference features a a day-by-day chronology, which extends from 1926-1967, detailing Coltrane's early years and every live performance given by Coltrane as either a sideman or leader, and a discography offering full session information from the first year of recordings, 1946, to the last, 1967. The appendices list every film and television appearance, as well as every recorded interview. Richly illustrated with over 250 album covers and photos from the collection of Yasuhiro Fujioka, The John Coltrane Reference will find a place in every major library supporting a jazz studies program, as well as John Coltrane enthusiasts. Lewis Porter, Ph.D., is Professor of Music at Rutgers University in Newark, New Jersey, where he directs the Masters Program in Jazz History and Research. He is a very active jazz pianist, recording artist, and composer, and an internationally recognized jazz scholar and author. Chris DeVito is the editor of Coltrane on Coltrane: The John Coltrane Interviews. Yasuhiro Fujioka is a freelance jazz writer, producer, and photographer who regularly contributes to Jazz Japan (formerly Swing Journal) and other magazines. He is the author of Coltrane: A Jazz Martyr and also of the photo book Coltrane Chronicle. Wolf Schmaler is a freelancer jazz researcher who has been conducting discographical research on Coltrane since 1989. David Wild has authored influential discographies of Coltrane and Ornette Coleman, written liner notes to many recordings on the Impulse! label, and has published in Down Beat, Coda, Cadence, Signal to Noise, and the New Grove Dictionary of Jazz. He is also a jazz pianist, composer and arranger.